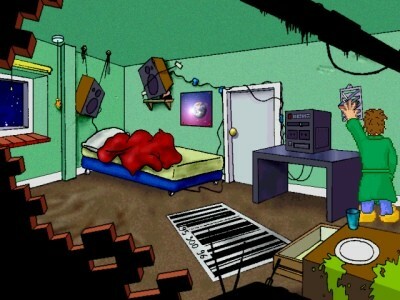 Out Of Order is a traditional 2D pointy clicky adventure game. It's a comedy thriller why-dunnit which could almost - almost - fall into the category "sci-fi". But only if it's pronounced with a non-silent "c" and to rhyme with "iffy". It's high-res and high colour, consists of around 30 rooms, took about 3 years to make and is, thanks to a sudden change of heart and a lazy streak about 4-foot wide, free. Ever woken up in the middle of the night to find you've been kidnapped... and so's your bedroom? Ever had to fend for yourself in the face of strangely hypnotic music, alien doctors, talking computers a-plenty and half-finished bathrooms? Ever found something unpleasant in a burger? If so, Out Of Order should play like any other day in your life. Otherwise, it's an experience not to be missed. If out of chaos comes order, what comes Out Of Order?